Vegetarian, gluten-free or dairy-free: 3, 10 and 12. RM500 and above: 1, 4-5, 7-8, 10 and 12. Boxed roses at Photo: Four Seasons Hotel Kuala Lumpur. Dinner under the stars at the Pool Bar & Grill encompasses 4 or 5-course meals for RM488 or RM788 per couple; opt for the latter to enjoy the privacy of a cabana and a complimentary bottle of red or white wine. Weather concerns? The Lounge also has Valentine's Day specials lined up. East meets West with the Avocado Rojak, Spring Chicken Confit, Lobster Curry and Sago Pudding. The 4-course menu (inclusive of 1 glass of champagne) goes for RM688 per couple whereas the 5-course menu (inclusive of 1 bottle of champagne) is priced at RM 988 nett per couple. If a large appetite is the glue that keeps you and your plus one together, head to Curate's Valentine's Day buffet. Each couple will be charged RM420 for full access to a lavish spread plus 2 cocktails/mocktails. If champagne is more up your alley, RM850 is your total. Loathe to show up on your date empty-handed? Pick up boxes of roses and pralines at Decadent by Four Seasons for RM210 onwards. With welcome cocktails called 'True Love,' it'd be hard not to get the giggles at Graze's Valentine's Day Celebration — thus breaking the ice with your date. An aphrodisiacal first course of freshly-shucked oysters (or tuna tartare, if bivalves turn you off) is followed by Lobster Bisque or Sun Blushed Tomato Soup, and Grilled French Sea Bass or Red Wine Braised Tenderloin for mains. Warm chocolate cake rounds up the meal. While the four-course meal is priced at RM220 per pax, we recommend getting the RM108 top up for a complete wine pairing. There will be chocolates and a rose for the lady/gentleman. Sharing is caring, hence the Valentine's Day Sharing Menu at Entier. Begin with an amuse bouche of Escargot & Chicken Liver Pate before exploring the Baby Cuttlefish with Basil Ice Cream. You and your date will have to vote for the Beef Short Rib with Truffle, Chicken Leg with Morel Sauce, or the Lobster with Lemak Risotto (supplement RM115), but dessert is fixed: souffle, milk and ice cream make up the sweet medley. Hats off to Chef Masahi Horiuchi for also presenting a Vegetarian Edition Menu this Valentine's. Start with the Spinach Cheeseball and Vegetable Tart before segueing into the Vegetable Garden. The Trio of Vegetables with Truffle will tempt even the most staunch omnivores, while the Truffle Pasta might turn them once and for all. The meat-free menu is priced at RM247 or RM199 per pax, with or without wine pairings. Photo: The St Regis Kuala Lumpur. Make memories at The St Regis Kuala Lumpur by way of high tea, libations and/or dinner. Experience a regal Afternoon Tea at The Drawing Room just the way Caroline Astor, mother of John Jacob Astor IV (founder of the original St Regis New York), enjoyed hers in the late 19th century. Priced at RM248 or RM158 per pax, with or without a glass of Veuve Clicquot, the teatime spread will include seasonal specialities. Hoping not to catch the attention of the public eye? Bubbles Forever at the Astor Bar promises a clandestine environment for cosying up over cocktails and Champagne. Valentine’s Day Dinner at The Brasserie, on the other hand, pulls out all the stops for a flamboyant experience. Partake of Alaskan King Crab, Wagyu Oyster, 36-hour Slow Cooked Short Rib or Braised Cod Fish as part of a 5-course meal concocted by Executive Chef Pedro Samper for RM348 per pax. Photo: The Majestic Hotel Kuala Lumpur. The only 5-star hotel in KL where you can immerse yourself in colonial architecture, The Majestic provides a fairytale-like setting for the most romantic day in the calendar. For RM550 per couple or RM275 per pax, enjoy Dinner at Colonial Café, which is inclusive of live music by Soliano, a Valentine's giveaway and a complimentary glass of bubbly. Meanwhile, Valentine's Day afternoon tea will be served in the tea lounge, the drawing room, or the Orchid Conservatory for RM88, RM108 or RM138 per pax. Save yourself the trouble of booking a meal, buying a gift, and planning an experience by opting in for one of two packages. Due to limited space in the Orchid Conservatory, only five couples will be admitted to Love Is Always A Celebration (6-course meal, glasses of rosé, flower bouquet, Malaya Golden Chersonese Couple's Spa Treatment Gift Voucher). A Classic Romance at The Smoke House (apéritifs, six-course meal in a private dining room, bouquet and after-dinner tipples) might be less exclusive, but is by no means less enjoyable. Both packages are priced at RM1000 for two. Photo: Bijan Bar & Restaurant. Just as much a celebration of unconditional love as a celebration of interracial marriage, the Baba Nyonya Dondang Sayang Menu at Bijan reminds us what makes Malaysia unique. Start with the 'Sharing Is Caring' platter (king fish otak-otak, prawn coconut and banana blossom rolls) and share the 'Match Made In Heaven' (combination of lobster laksa and ribeye daging salai) before finishing off with the 'Happy Ending' (rambutan sorbet and tapai pulut with mango). All this and two cocktails/mocktails for RM398 per couple. Fresh Oyster with Ikura and Ponzu. Photo: Cé La Vi. Suited for couples who enjoy a bit of sport, Dirty Dancing at Cé La Vi includes a prize for the Best Dressed Couple that adheres to the 1980s film theme. There will be food (think fresh oysters with ikura and ponzu, tuna cheek, Japanese choux with green tea crumbs, and more), fun (live entertainment), drinks (cocktails at The Lounge) and dancing late into the night (did we mention the state-of-the-art sound system?). Simply reserve your spot with a down payment of RM1088 for two pax, inclusive of wine cocktails. Woobar. Photo: W Kuala Lumpur. Down to shuck? W Kuala Lumpur's Anti-Valentine's Day event at Woobar pairs oysters with an open-minded attitude. Arrive single and ready to mingle from 8pm onwards. Complimentary bar snacks such as tequila candy, chicken chorizo beignets, and black heart jello shots will make the rounds while resident DJ Victor G heats up the turnstiles. Does your heart already belongs to a special someone? Surprise him or her with a Valentine's Day 5-course Set Menu at Flock for RM488 or RM288, with or without wine pairing. Lobster & Chevril Raviolo in Shellfish Emulsion, Lamb Noisette with Heirloom Carrots and Fried Polenta, and Steamed Black Cod with Petits Pois à la Fraçaise will be served post welcome cocktails. Book yourselves a 'honeymoon' to the Caribbean without ever leaving town. Chef TJ of Joloko is whipping up a feast comprised of fig and olive tapenade, smoked beetroot hummus, the Joloko seafood cocktail, Moroccan goat curry, Blue Lingcod en papilote, braised pork collar, sweet potato chipotle croquettes, brussel sprouts with crispy pork belly and Riesling, and flourless chocolate cake. Spaces are already filling up for this dinner priced at RM160 per pax, so act fast. Photo: Grand Hyatt Kuala Lumpur. THIRTY8, one of our favourite elevated restaurants in town, puts you on the same level as the Twin Towers' connecting bridge; in fact, you're basically sat right across from it. Toast to a good time with Rose Fairy Cocktails, regardless of whether you choose the Regular Valentine's Day Menu or the Vegetarian Valentine's Day Menu (both are RM680 per couple). The former comes with smoked salmon tartar, a crustacean bisque, lemon grass sorbet as a palate cleanser, Australian Black Angus tenderloin with truffle beignets or Alaskan cod fillet, and a white chocolate and raspberry jelly parfait, while the latter swaps beetroot salad for smoked salmon, watermelon and vanilla gazpacho for soup, and sour cream risotto for your main. Not a man of words? Simply say it with an exquisite bouquet of red roses: 'Be Mine' is RM250 for 12 stalks, 'I'm Yours' is RM480 for 24 stalks, and 'Unconditional Love' is RM700 for 50 stalks. Customise each bouquet with a hidden love note at no extra charge. Apple Confit Parfait. Photo: Soul Society Group. 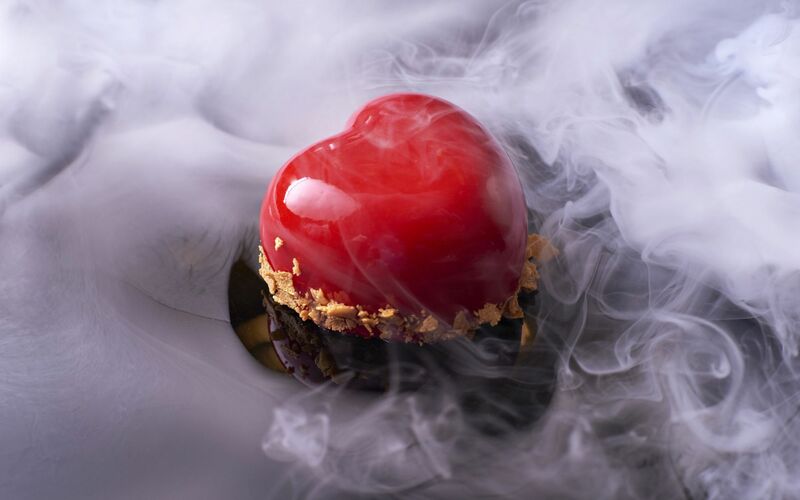 Named after the first couple on earth, the Adam & Eve Menu at WIP begins and ends with a taste of forbidden fruit. Butternut Squash Apple soup is followed by Citrus Mixed Berry Salad, Pommery Salmon or Tenderloin with Berry Coulis, and finally, cold Apple Confit Parfait. Also thrown into the mix for RM268 per pair: a seasonal cocktail dubbed 'The Garden of Eden’ and a live performance by a snake charmer. How's that for a cool photo op? Photo: Isadora Chai / Bistro à Table. Caviar, a special on Bistro à Table's Valentine's Day menu, is as varied as they come. Discover Beluga caviar from Italy and learn to differentiate pasteurized from unpasteurized Amur sturgeon from T’lur at via the ultra-luxe sturgeon caviar taste flight. Due to limited supplies, only 20 couples may opt in for the tasting; sample two or three varieties for RM400 or RM750. To keep disappointment at bay, Bistro à Table will also be serving a full course Valentine's Day Menu. Begin with more caviar atop cold pasta, segue into strozzapreti soft egg noodles, sup on roasted quail stuffed with foie gras, and more for RM190 per pax. While many chefs in town rule out menu changes, Chef Isadora Chai happily caters to diners with dietary restrictions; simply pre-empt her if your party has any allergies.